Our engineered hardwood flooring samples are a collection of different wood flooring with various wooden floor finishing. We are specialized in engineered oak wood flooring, so most samples will be made from oak wood using different types of finishing. 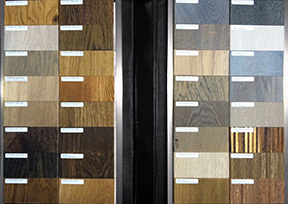 Are you interested in certain wood species, or would like to see certain colors, oils, or lacquers? You can use the text box at the bottom of the form to let us know what kind of samples you would like to see. We can prepare a personal sample book for you! Have a look at our engineered hardwood flooring grades and sizes to get an overview of the engineered hardwood floors we produce. Please fill out the form below to receive your engineered hardwood flooring samples book via mail. Our engineered hardwood flooring samples book contains small pieces of the wooden floors we produce. Each sample has a tongue and grove. All wood flooring samples have been finished with various oils and/or lacquer. We have developed many unique wood flooring oils and lacquers that you can’t find anywhere else. Our standard sample book for engineered wooden floors contains flooring samples with either natural and synthetic oils, as well as various lacquers and top coats for better protection.With almost 10 years of experience in manufacturing engineered hardwood flooring, we have developed a nearly countless number of oil colors and other wood finishing. We highly recommend ordering our standard floor samples book, which includes some of our finest engineered wooden floors.